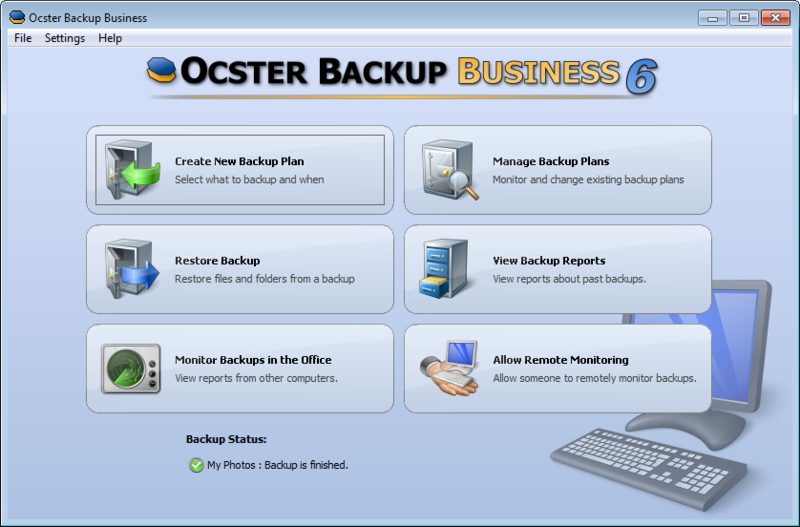 Ocster Backup Business 6 is optimized for small businesses and creates fully automatic backups of your files and folders. It supports versioning (access old versions of your files), remote monitoring of backups and automatic pausing. Also supported: online backup (optional), Outlook backup, Firefox backup, Thunderbird backup, 1:1 file copy, contacts backup, incremental backup, encryption, compression, open file backup, and much more. Ocster Backup Business 6 also offers a "1:1 File Copy" mode: your files are simply copied to the backup medium and are not put into archives. If you want direct access to your data then this option is for you. WinBackup 1.86 - Backup Made Easy! Qweas is providing links to Ocster Backup Business 6 6.26 as a courtesy, and makes no representations regarding Ocster Backup Business 6 or any other applications or any information related thereto. Any questions, complaints or claims regarding this application Ocster Backup Business 6 6.26 must be directed to the appropriate software vendor. You may click the publisher link of Ocster Backup Business 6 on the top of this page to get more details about the vendor.